Early Porcelain Fortune-Telling Doll for the French Market 8" (20 cm) including hat. 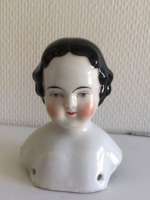 Porcelain shoulder head with black sculpted hair, painted facial features, muslin body,china arms and ,wooden legs with flat shoes.Circa 1880.The doll was used for presentation of fortune-telling made for the French market. 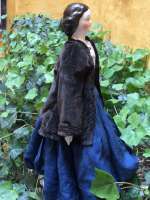 She is wearing original gold-brown velvet gown with black lace. Matching hat with band.The fortune teller has an "under-skirt" composed of hundreds of folded paper fortunes, each with a hand-written fortune in French language. 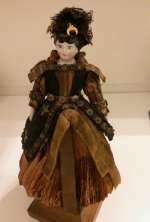 It is rare to find a fortune -telling doll in such a complete state. Size of doll 20/ 8" with hat". Stranding on a wooden base. 5 cm / 2". æShe is all original. A very rare and intersting doll for the collection. In wonderful condition. Schöner Glasierter Puppenkopf um 1860. Schöner Glasierter Puppenkopf um 1860. Biedermeier. 9,3 cm hoch. Sehr schön bemalt. Ohne Fehler oder Risse. 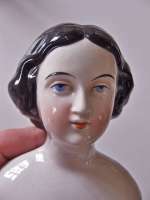 Jenny LIND.21"Beautiful early Jenny Lind Portrait china doll. Light red coloured china. She is German, circa 1850.Has the wonderful blue eyes, molded eyelids, with a red line above and a delicate expression.Long slender neck. 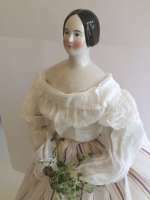 Hair is parted in middle and pulled to the rear in a braided bun.She has a pale pink tinted shoulder head with 3 stringing holes, excellent china quality. This beauty lady with comes on her original slender body with china lower limps..She is dressed in a lovely antique dress and underwear-original to the doll . The doll is in perfect condition. Jenny Lind was a famous 1850''s Swedish Opera star also known as the "Swedish nightingale" who Hans Christian Andersen fell in love with and wrote about. 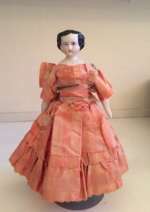 Shown on page 49 "China Parian Dolls" by Lydia Richter. Wonderful china head doll. Jenny Lind. Named from the Swedish singer, described by Hans Christian Andersen.All original. Shoulder head in great condition. No repairs. Very fine china. A very special and great doll to add to your collection of early dolls. Size: 45 cm / 17"